In December 2006 Mozilla launched its first Firefox ads campaign on TV. A few fans were given the opportunity to sponsor an ad, and I had the honor to be one of them. 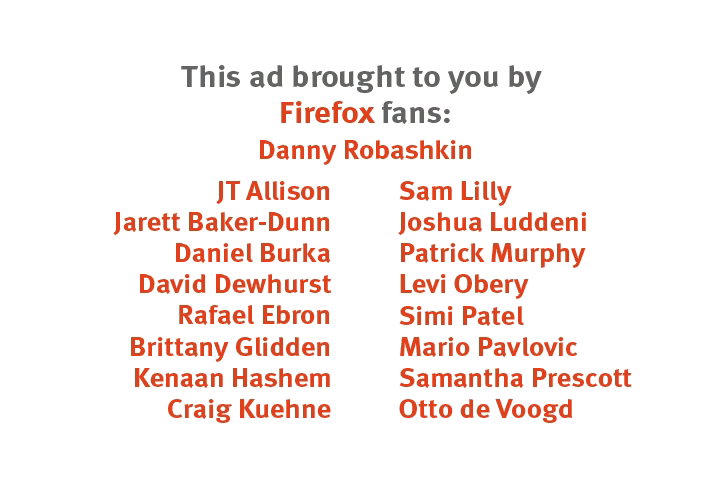 I chose to sponsor the video called This Is Hot, which was made by Danny Robashkin. This video had always been my personal favorite Firefox flick. Here is the high resolution version of the flick as it was aired. Your browser does not support HTML5 video! Download the video for viewing with another application. Download: mov (23 MB), webm (1.6 MB), ogg (1.6 MB), mp4 (1.6 MB).